Faith received her Bachelor’s degree from The University of Florida and her Juris Doctor from Florida Coastal School of Law in May 2013. Faith was admitted to the Florida Bar in November 2013. 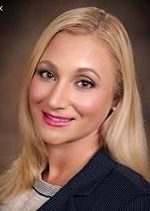 Ms. Searles practices in the area of Insurance Defense, specializing in Workers’ Compensation. She represents employers PEO’s carriers and third party administrators regarding all workers’ compensation matters. While in law school Ms. Searles was a member and Lead Research Assistant for the Public Interest Research Bureau, providing practice-quality research and analysis to poverty lawyers representing the poor in a range of civil issues. She is a member of the Phi Delta Phi Honors Fraternity and Dean Scholar. She has worked as a volunteer for the Muscular Dystrophy Association sponsoring research, seeking the causes of and effective treatments for neuromuscular diseases. Ms. Searles was able to gain experience working in her field at a Workers’ Compensation and Insurance defense firm and then at a civil defense firm representing management in litigation and trial practice specializing in labor employment, civil rights and the prosecution and defense of other business interests. She is a member of the Workers’ Compensation section of the Florida Bar and is committed to excellence in service to her clients.